(CNN) -- Members of the Shriners fraternity voted Monday to withdraw a measure that would have closed six of the 22 Shriners Hospitals for Children, representatives of some of the facilities said. The Shriners hospital in Greenville, South Carolina, was one of the facilities eyed for possible closure. Delegates to the Shriners' annual convention in San Antonio, Texas, also voted to reopen one of the facilities: the Galveston, Texas, hospital that suspended its operations after Hurricane Ike flooded it last year. However, the more than 1,000 delegates still are determining how to operate all the hospitals in a difficult economy, and they still could decide to close facilities if agreements to cut costs aren't reached by the convention's end Thursday, the hospital representatives said Tuesday. "We're cautiously optimistic" that the six hospitals will stay open, said Sally Mildren, public relations director for the Shriners hospital in Spokane, Washington, one of the facilities that had been considered for closure. It appears "very unlikely" that delegates will decide to close hospitals, "but we also understand that nothing is final until the convention is closed on Thursday," said Bob Howden, public relations director of the Shriners hospital in Erie, Pennsylvania. The hospital system's headquarters in Florida declined to comment on the votes except to release the following statement through an outside public relations firm: "We will have a press conference on Thursday. At that time, all pertinent information will be released." 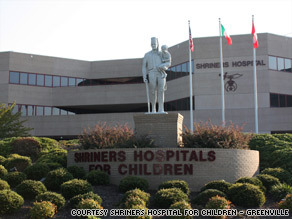 The measure would have closed the Shriners hospitals in Spokane; Erie; Greenville, South Carolina; Shreveport, Louisiana; Springfield, Massachusetts; and Galveston. The hospitals normally operate with the fund's interest and donations, but the system's $856 million budget was outpacing both, causing the hospitals to take about $1 million per day from the fund, Ralph Semb, president and CEO of Shriners Hospitals, said earlier this year. The hospital system has treated hundreds of thousands of children free of charge since the first facility opened in Shreveport in 1922. Most offer orthopedic care. Four, including the Galveston hospital, care for children who are burned. News of Monday's votes delighted Bridget Myers, whose 14-year-old daughter, Brooklynn, is a scoliosis patient at the Greenville hospital. Brooklynn had her spine straightened in surgery there in December and has healed enough to make her high school's cheerleading squad, her mother said. Brooklynn, a Greenville resident, is to receive follow-up care there until she is 18. The one-income family doesn't have private insurance and wouldn't have been able to afford the "top care in the world" she received at Shriners, Bridget Myers said. And should the Greenville facility close, the family would find it very difficult to travel to the next nearest Shriners hospitals, in Lexington, Kentucky, and Tampa, Florida, she said. Delegates will now consider alternatives to closures, including possible partnerships with non-Shriners hospitals and allowing Shriners hospitals to accept insurance from patients who have it, Mildren said. The hospitals currently pay for everything and do not take insurance. One proposal will be to have the hospitals accept insurance or Medicaid from families who have them, but cover co-pays and deductibles, Carl V. Nielsen, a board member for the Minneapolis, Minnesota, Shriners hospital, said earlier this year. Semb said before the convention that the idea had some merit, but he cautioned that to accept insurance and Medicaid, the hospitals would subject themselves to more federal oversight and possibly curtail their ability to treat patients as they see fit.